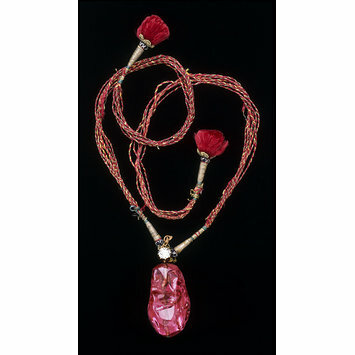 This gemstone is a spinel, a stone gemmologically similar to a ruby. 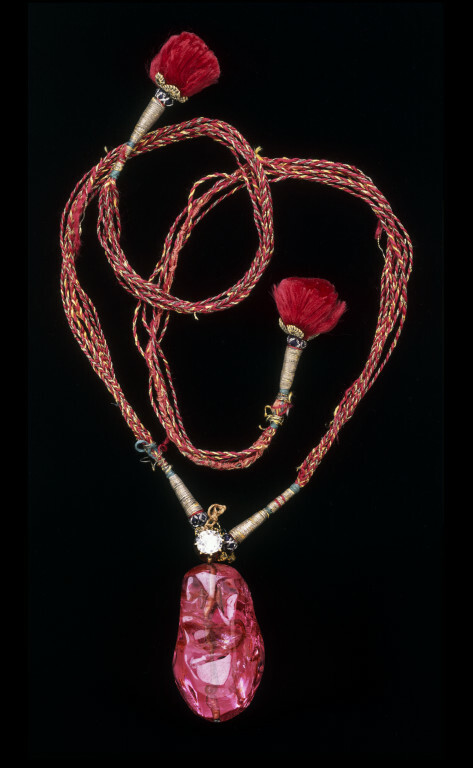 It is inscribed with the names or titles of the Mughal emperors Jahangir (r.1605–1627), Shah Jahan (r.1628–1658) and Alamgir (r.1658–1707), the former Mughal prince Aurangzeb. It was bequeathed to the V&A in 1922 by Julia Mary, Lady Carew. Information supplied by her family stated that it had been bought by a relative in Tehran before 1870. 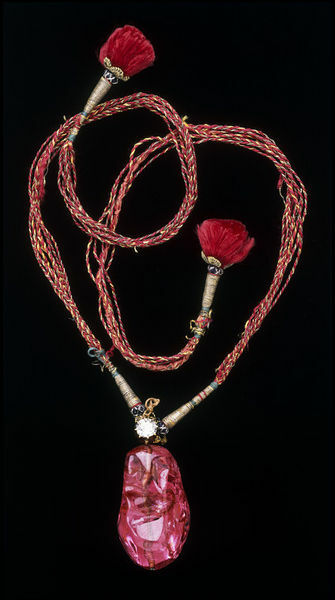 The Carew spinel engraved with the titles of Jahangir (r.1605-27), Shah Jahan (dated 1629-30) and 'Alamgir (Aurangzeb) (dated 1666), drilled from both ends across its longest dimension. The gold pin is secured by a diamond at top and bottom. These are the titles of Jahangir, Shah Jahan (2) and 'Aurangzeb respectively. Susan Stronge, in The Indian Heritage. Court Life and Arts under Mughal Rule, V&A, 1982, cat. 297, p.108, ISBN 0906969263. The inscriptions were added by a specialist engraver within the imperial court workshops.